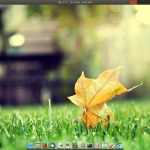 Elementary OS 0.2 Luna is a new Linux distro that has become quite popular recently. 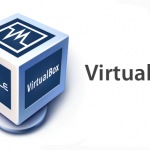 It is based on Ubuntu 12.04 LTS and has a visual design that resembles Mac OS very closely. 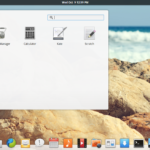 This is the second version of elementary OS and the previous one was codenamed Jupiter. Elementary introduces a new desktop environment called Pantheon along with its own window compositor/manager named Gala based on libMutter. The Pantheon desktop gives a mac os like look and feel but at the same time makes the desktop surprisingly simple and intuitive to use. The goal is to provide the best user experience. I have been using KDE (Kubuntu) for almost a decade now and never moved out of it. Seldom used gnome or Xfce or any of those lighter desktops environment. But Elementary has a strong appeal at the very first impression. So in this review I would try to discover what elementary has to offer for an average user like me and how does it compare to other distros like linux mint and ubuntu. Check out the website at http://elementaryos.org/. Download the iso image which is around 694 MB. You can then burn the iso to a cd/dvd or simply write it onto a usb drive with a tool like Unetbootin. Now you are ready to try out the new OS on your system. Like most other linux distros, elementary would allow you to boot into a live session to take a test drive and get to feel it without having to install anything on your hard drive. At the first sight the Elementary desktop is absolutely attractive and charming. Its a super polished and spacious desktop. 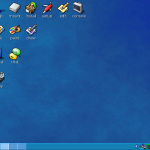 The desktop is composed of a panel (WingPanel) on top, a menu called Slingshot on the left of Wingpanel, system tray icons on the right part of Wingpanel. At the bottom is the dock called Plank that holds launcher icons for selected applications as well has indicator icons for apps that are running. The menu, the dock, top panel, window decorations and almost everything posses a uniform design that depicts artwork of a great degree. It is further blended with a very gentle touch of visual effects giving the desktop a very soothing appearance. The visual design appears to be composed of great perfection at every pixel. Going further elementary puts together one of the most impressive collection of wallpapers I have ever seen on a linux distro. In addition to that elementary uses the Droid fonts which I find to be the best. The developers seem to have left out nothing that can be put together to make the most attractive looking linux desktop. elementary is crafted by designers and developers who believe that computers can be easy, fun, and gorgeous. By putting design first, we ensure we're not compromising on quality or usability. 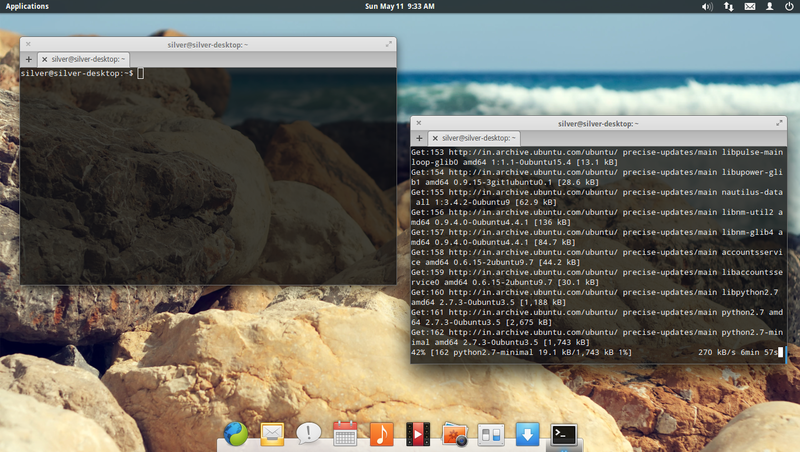 Elementary OS is by far the most attractive looking Linux distro I have come across. You can launch applications either from the Slingshot menu on top left or from the Plank dock. The Plank dock holds icons for launching apps, but also icons for currently running apps. The Slingshot menu can display the icons in 2 layouts, either all together, or sorted category wise with the category list onto the left. On elementary you do not have a pager with an icon for each desktop. Instead there is the Workspace Overview interface that rolls in a horizontal strip of current workspaces at the bottom of the screen. To activate the Workspace Overview pane press "Super + S". The super is the windows key on the bottom left of your keyboard. In the workspace pane you see the currently active workspaces and blank workspace at the end, which would launch a fresh new workspace upon clicking. So in this way you can create as many workspaces. There are 2 more ways to active the workspace overview pane. First is to use hot spots, that would transform a particular corner of the screen into a switch to perform a specified action. 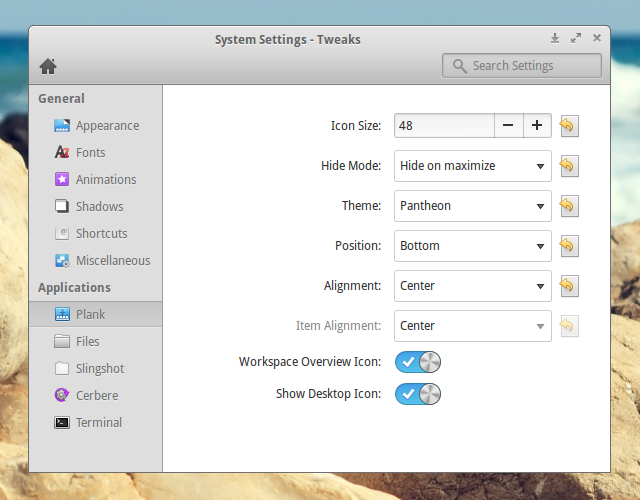 Go to System Settings > Desktop > Hot Corners and assign a hot corner to display "Workspace Overview". Alternatively use the Workspace switcher icon in your plank dock which would active the workspace overview. To get the workspace switcher icon in your Plank, use Elementary Tweaks tool as discussed later in this article. For switching windows or applications, either click on the icon on the dock (icons of active applications have a blue glow) or use the "Windows Overview" screen which would display all windows side by side allowing the you to choose the window you wish to switch to. Press "Super + W" key to call the window overview screen. Or configure a hot spot for the same task. 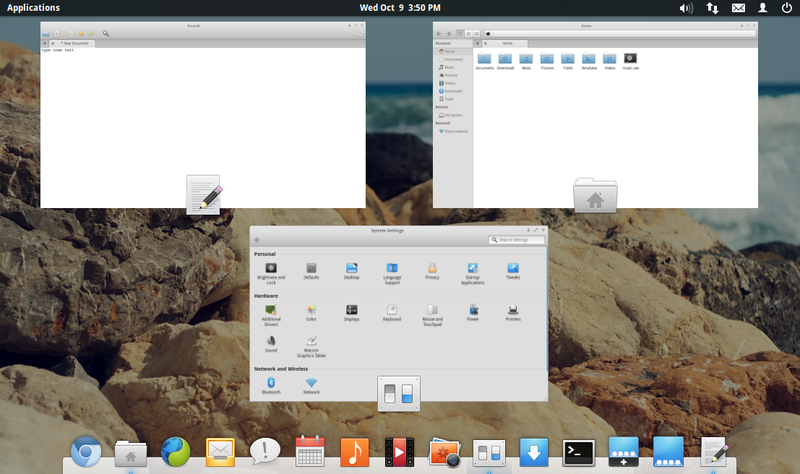 That was a brief overview of how elementary OS looks and how users have to interact with it. The user interface is really simple to use and very polished in appearance. Elementary comes with a a very small set of applications. There is no office suite, no office applications (except pdf reader), no graphics editor and no torrent client. Here is a list of the applications included in the default installation. Elementary has its own file manager application called pantheon-files which has a very simple and intuitive user interface and a sleek design. 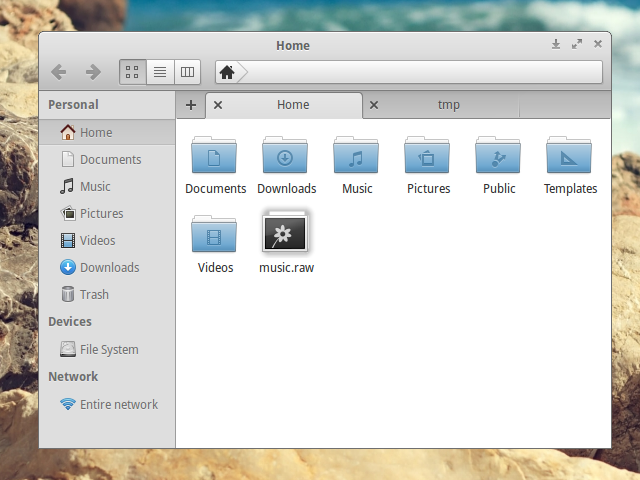 It is very similar to the Thunar file manager that is present on Xubuntu. The terminal emulator is pantheon-terminal, which again is an elementary specific program. In the default configuration it has a transparent glossy look. The default web browser is Midori, a webkit based browser built using gtk libraries. It works fine for basic web surfing, but is tiny compared to the feature rich chrome and firefox, so you would need to get one of the bigger browsers. Furthermore there are complaints that flashplayer does not work well with Midori. Empathy is the chat messenger installed with elementary. However I have been using Pidgin for years and prefer to continue with it. The list of internet apps also includes the Geary mail client that allows you to send and receive emails right from your desktop. On the multimedia front, the default audio player is "Noise". The application title is "Music", but the real name is "Noise". Not sure why. It has a very simple and intuitive user interface. 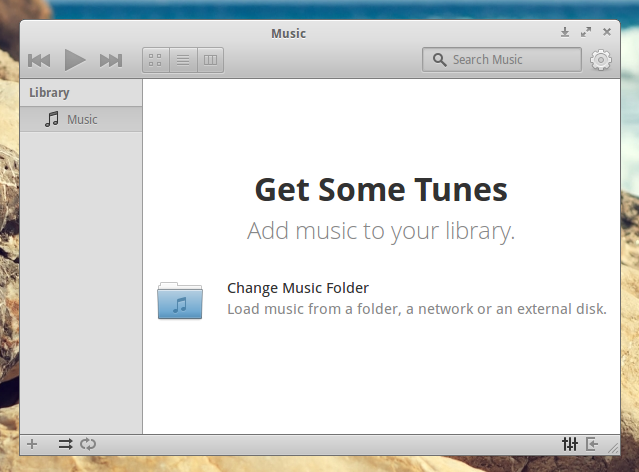 Noise cannot play mp3 files when elementary OS is just installed. When you try to open an mp3 file it would prompt for permission to download the necessary gstreamer codecs for playing mp3 (gstreamer0.10-fluendo-mp3). Install the codec plugins and then Noise would start playing mp3 files. For playing videos elementary installs the Totem movie player. Totem uses the gstreamer and xine libraries for decoding and playing videos. Totem should be able to play most of the videos you bring to it. But I have previously seen it running into issues when playing certain video formats and old vcds, even with the correct codecs installed. Those were bugs sometime back and are mostly fixed by now. In case any of your videos or discs fail to play with it, you can always switch to another video player called called vlc. It is a very capable media player that plays lots of video formats. It is available in the software repository. Elementary Tweaks is a tool that enables you to customise the desktop further. It is similar to what the gnome tweak tool does for the gnome desktop. Elementary tweaks has to be installed from a separate ppa repository. It would appear as an additional section (named Tweaks) in the "System Settings" area. Elementary Tweaks allows you to change the fonts, the window button layout, plank settings etc. For example I keep the "workspace overview" and "show desktop" buttons on the plank. Visual effects like animations and shadows are also configurable. They can be turned off if the system is running low on system resources. From my own tests I wish to conclude that Elementary OS is not suited for low end hardware. Although the website claims it to be a lightweight OS recommending 1GHz processor with 1GB ram for smooth performance, I found things to be very different. Elementary OS was not even able to reach the login screen on my old HP Pavilion laptop that had a 1.6ghz core2duo processor with 1GB ram. On the same machine I use Xubuntu. On my desktop with 8GB ram + core2quad 2.6ghz, elementary worked but there was a slight noticeable lag in the display rendering. Turning off shadows and animations via elementary tweaks made it work better. This indicated that available hardware resources were not enough for elementary. On a machine with dedicated nvidia geforce 200 gpu and latest nvidia drivers, elementary OS gave a decent performance. That should give an idea of the kind of hardware you need, to be able to experience elementary to its full. I would recommend atleast 2Gb ram + 2ghz quad core processor + dedicated GPU, if you want to enjoy elementary OS to its full. Elementary is based Ubuntu and so is fully compatible with its software repositories. It uses the same ubuntu repositories and with an additional ppa repository for its own packages. So you should be able to install any software on elementary that you can install on Ubuntu. Just make sure to choose the right version. 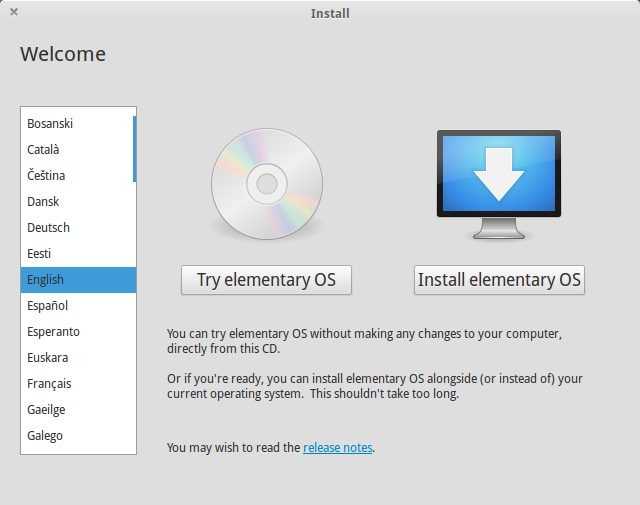 Elementary OS 0.2 is based on Ubuntu 12.04 LTS so you need to pick the packages that are built for this Ubuntu version. For installation Elementary uses same Ubiquity installer as Ubuntu and should look familiar if you have fiddled with it before. The installation process is fast and takes around 5 minutes or less. The linux desktop environment space is getting over crowded with so many new options coming up. Gnome 2 transformed into the Gnome Shell, Ubuntu morphed it into Unity and Linux Mint brought in Cinnamon and Mate. Now Elementary brings in its very own Pantheon. I personally do not like the Gnome shell or unity desktops. In my opinion the only reason for Linux Mint's popularity is the desktop environment it offers. Both Cinnamon and Mate preserve the traditional desktop paradigm which most desktop users are familiar and comfortable with. The same goes with KDE. So in my opinion, most users are really looking for enhancements to the same desktop from various angles like usability, aesthetics and functionality. 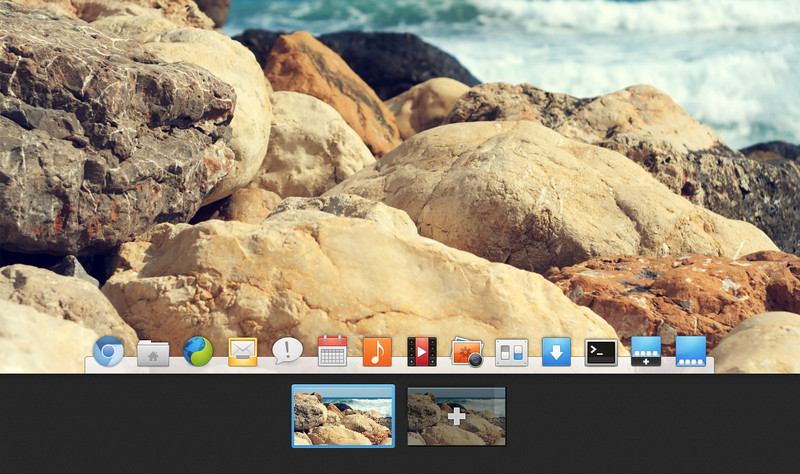 Elementary OS with its Pantheon desktop makes a good effort to achieve all of those. The Pantheon desktop has a minimalistic and straight forward user interface. The visuals are excellent and the functionality is similar to what you get on the Xfce or Cinnamon desktops. This makes it easy for users to get accustomed to the new environment without having to learn much. If elementary continues well along these lines of providing a perfectly balanced desktop that is high on both style and usability, it would no doubt soon be a popular distro like linux mint. Or is it already very popular ? Check out the ratings on distrowatch and you might be surprised. 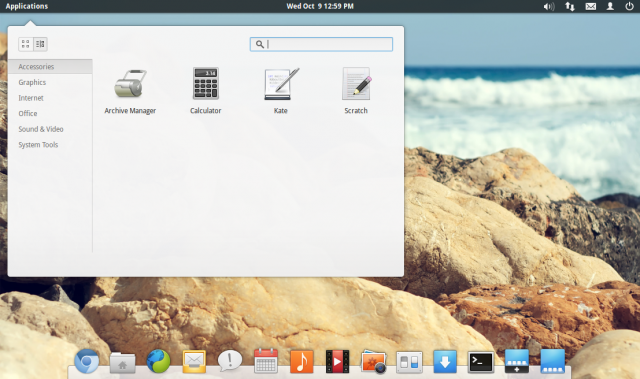 With its stylish attractive looks and super simple usability approach, elementary OS provides a solid user experience. If you are coming from a windows or mac background then elementary os is an ideal first linux distro to try out. The only thing that caused a little discomfort was the system performance in terms of speed. I found elementary to be slow and sluggish more than Ubuntu Unity and Linux Mint Cinnamon even on very adequate hardware. I have no idea if its some hardware compatibility issue on my end or if elementary is supposed to be like that. I did not dig any further. You have to see it for yourself. Overall its an excellent distro. The slowness you experienced may have been limited to your hardware. I’m running a Celeron 1.8GHz single-core with 4GB RAM and Elementary OS is fast for me. Your hardware performance might have been system specific as I just installed elementary OS on an old Dell Inspiron 1200 laptop; 1.3ghz CPU, 512mb RAM and a 40gb HD and with the exception of system intense actions, it’s running rather smoothly for the low specs it’s running on right now. Installing was actually a bit unbearable and I could not download updates during install nor install the third party addons due to the 512mb of ram. Once installed to harddrive though I was able to get the rest of it all installed. Installing through software center is a bit slow, but installing via terminal is so much quicker. For the sake of it though, I did order a 1gb RAM stick for this old laptop. Nice and Zippy, may be my new distro! Midori is a WebKit browser. Hello! Gratz for this amazing review that it made me to test it and like it ;) But for to be honest i still find gnome 3 in the terms of polish…a bit more improved and polished. Still Elementary OS give you a more retro style…i dont know if its the whole transperancy of gnome 3 and the great luncher with beautiful icons but well i think that icons of Elementary are still kinda cartoon style?! Its meant to be like that. like the flat icon them used in Mac OS Yosemite. I also would say, the Terminal is pretty much perfect! Type codes in terminal which running Tmux and VIM are enjoyful! Choose it, new name — Luna! are you saying that this os is not recommended for those of us who code on their computers? Can you runs KDE environment in Elementary? I am relatively new to Elementary and I am a professional programmer. I would like to compare Pantheon and KDE so is this possible? Great review, the comparisons with the other DEs help to understand where elementary stands in term of user experience. Keep it up.